Captain Accident is a reggae/ska/soul artist who creates a unique blend of soulful lovers rock, roots reggae, ska, dub and rocksteady at his home studio in Cardiff. This sound is then brought to life on stage with the help of a collective of musicians known as “The Disasters” although in reality, they are far from disasters! The energetic live show is guaranteed to get people up and dancing. With soulful vocals, soaring twin guitars and a truly infectious groove, there’s no standing still when Captain Accident and his clumsy sidekicks hit the stage. Captain Accident currently has 3 self produced albums under his belt: “Pick up the Microphone” (2010), “Slippin Up” (2013) and his most recent release “Wake & Break” (2016) which has received great reviews and praise, including that from the legendary Sir David Rodigan on his BBC Radio 1xtra Reggae Show. Through intensive touring of the UK and Europe, numerous music videos, countless festival appearances and some high-profile radio airplay, more and more people are becoming aware of Captain Accident’s unique sound. 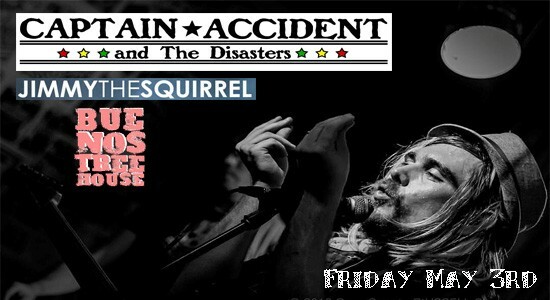 With a national fan-base growing by the day and a live performance gaining so much momentum in terms of sound and energy, Captain Accident and his live touring band “The Disasters” are becoming harder and harder to ignore on the UK reggae/ska circuit and further afield. Captain Accident and The Disasters have recently been lucky enough to join reggae heroes Toots & the Maytals on a run of dates during their 2016 UK tour. As one of the Captain’s major musical influences, this goes far beyond anything that Captain Accident would ever have even dreamed of when he set out on this clumsy reggae journey and has made 2016 an absolutely unforgettable year! Jimmy the Squirrel are a 4 piece band based in Nottingham, UK. Signing to Do the Dog in 2008 JTS have gigged across the country, receiving excellent reviews and air play on national and international radio stations. They released their debut full length album 'Whatever The Weather' -produced by Sean Flowerdew of (Rockers Revolt / Pama International) and mixed by Ed Rome- on Do the Dog Music in July 2010. After several years in hiding JTS bought their live show back to a reunion show at Nottingham's Rock City (which sold out) in late 2018 and now in 2019 return to The Maze, a venue they played on a regular basis in the past, for the first time in nearly 5 years to spend once more their wonderful Ska/Reggae sounds! One of Nottingham's best Pop Punk acts, Buenos Treehouse have smashed shows across Nottingham over the last few years with their well crafted, catchy, Pop Punk, Alt Rock sounds and feature ex and current members of local favorites such as The Rutherfords, Arse Full Of Chips, The Atoms, Breadchasers and The Sneaks. Expect a real fun party atmosphere as these 3 fantastic bands bring you a night to remember! !